Eggless Coconut Chocolate Cake is a perfect celebration treat. 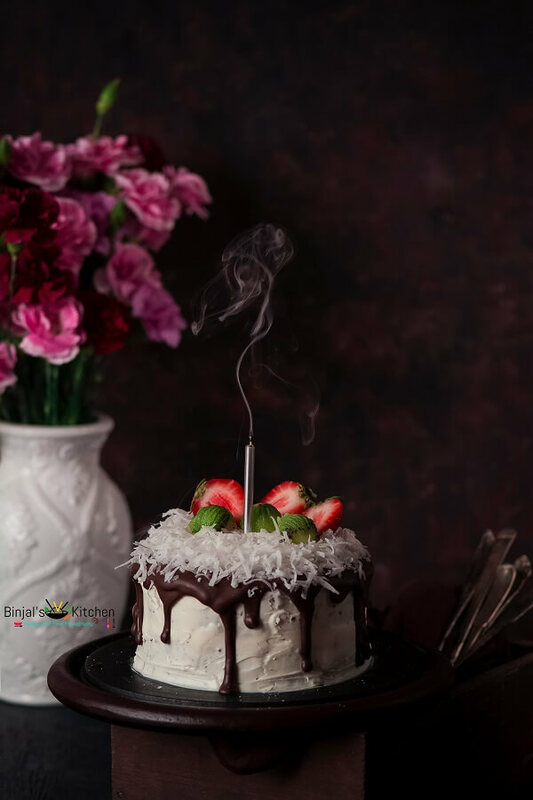 Eggless Coconut Chocolate Cake doesn’t have egg still Eggless Coconut Chocolate Cake is very delicious, soft and spongy. Eggless Coconut Chocolate Cake is very easy to make. Coconut and chocolate is one of my favorite combinations. Even better if those two ingredients are in the form of cake. I usually don’t bake much cake as my family doesn’t have sweet tooth specially me and my husband. I love baking, but most of the time I bake savories like pizza, pasta, lasagna etc. or breads. However, this time my girls demanded to eat cake and with decoration, as there is not any reason for celebration or not even any festival day! So, decided to make this cake with simple decoration so they can feel it’s decorative cake and that too before they come from school, so I can take photos without any disturbance, otherwise when girls at home and if I do something like this I can’t manage to click even a single shot. Eggless Coconut Chocolate cake that is not only a show stopper, but it tastes great as well. Made from scratch chocolate cake layered with cream and coconut frosting is truly exceptional. A thick chocolate glaze is smoothed over the top of the cake and runs down the sides adding character and more chocolate flavor. The cake layers are thick, dense, light, and super moist. This cake may look wise or sounds complicated, but trust me, it’s really very simple and easy! 1. Preheat an oven on 350F/175C. 2. Sieve the flour, sugar, baking powder, baking soda and cocoa powder through strainer and mix it well. 3. Now in another bowl, add all wet ingredients (water, butter, oil, milk and vanilla extract) and mix well with spoon. 4. Now slowly-slowly add wet mixture into the flour mixture and mix it with a spatula and make a lump free mixture, you can use hand whisker to mix and make a smooth batter. 5. Take round 6 inch springform or baking pans/tins, divide the mixture/batter evenly between the two pans. 6. Place the pans/tins into the preheated oven and bake it for 35-40 minutes or until a toothpick inserted into the center of the cake comes out clean. 7. Once done, let it be cool down for 3-4 minutes, then remove it on the cooling rack and allow it cool down completely about 10-15 minutes before frosting. 8. In another mixing bowl, add cream cheese (soften in room temperatures), melted butter and mix it well for 3-4 minutes till foamy and soft. 9. Add powder sugar, vanilla extract, milk or cream and mix it well, stir it for 3-4 minutes, make soft and foamy frosting. 10. Remove the thin slice top of the both cakes using a sharp knife and make a flat surface. 11. Now take one cake, evenly spread the frosting over the cake surface and sprinkle some coconut flakes over it. 12. Then place the second cake on it, again spread the prepared frosting over the top and sides of the cake, remove the extra frosting using scraper and make thin coat all sides. 13. Now take the chocolate chips in a microwave safe bowl and melt it as per the package direction. 14. Drizzle the melted chocolate along the edge of the cake all the way around, allowing it to drip down the sides. 15. Then Sprinkle remaining shredded coconut over the top and decorate it with halved strawberries and kiwi balls. 16. Eggless Coconut Chocolate Cake is ready, place it in the fridge and serve whenever you want! • You can store the cake in the fridge up to 2weeks. • You can use fresh coconut to make flakes, just grate or shred it add little bit sugar and mix it to make sweetened. • You can add ½ tsp instant coffee powder into the wet ingredients to make more flavorful. • Adding fresh fruit over the cake is absolutely optional, you can use as per your choice. Preheat an oven on 350F/175C. Sieve the flour, sugar, baking powder, baking soda and cocoa powder through strainer and mix it well. Now in another bowl, add all wet ingredients (water, butter, oil, milk and vanilla extract) and mix well with spoon. Now slowly-slowly add wet mixture into the flour mixture and mix it with a spatula and make a lump free mixture, you can use hand whisker to mix and make a smooth batter. Take round 6 inch springform or baking pans/tins, divide the mixture/batter evenly between the two pans. Place the pans/tins into the preheated oven and bake it for 35-40 minutes or until a toothpick inserted into the center of the cake comes out clean. Once done, let it be cool down for 3-4 minutes, then remove it on the cooling rack and allow it cool down completely about 10-15 minutes before frosting. In another mixing bowl, add cream cheese (soften in room temperatures), melted butter and mix it well for 3-4 minutes till foamy and soft. Add powder sugar, vanilla extract, milk or cream and mix it well, stir it for 3-4 minutes, make soft and foamy frosting. Remove the thin slice top of the both cakes using a sharp knife and make a flat surface. Now take one cake, evenly spread the frosting over the cake surface and sprinkle some coconut flakes over it. Then place the second cake on it, again spread the prepared frosting over the top and sides of the cake, remove the extra frosting using scraper and make thin coat all sides. Now take the chocolate chips in a microwave safe bowl and melt it as per the package direction. Drizzle the melted chocolate along the edge of the cake all the way around, allowing it to drip down the sides. Then Sprinkle remaining shredded coconut over the top and decorate it with halved strawberries and kiwi balls. Eggless Coconut Chocolate Cake is ready, place it in the fridge and serve whenever you want! Lovely Binjal!! And as usual awesome photography .